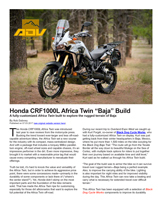 BDCW has released an entire suite of bomber products for the Africa Twin. For both the clutch and DCT models we have you covered! Call or write for assistance or if you have any questions. Read this review by ADVPulse for an excellent overview of BDCW upgrades. We have received many questions for parts for the new Adventure Sport - we have confirmed our skid plate and radiator guards will fit without modification. We are working on other parts that will fit this model.